Squeaky Books: Don't panic! It's not over yet! Can you believe that this is the last full day of the birthday bash? *sniff* We have to wait a whole year until the next one. Sad day! The bash ended up with 15 giveaways! Crazy! Below I've included links to all of the contests and reminders of what's required to enter. All contests end tonight at 11:59pm MST. But wait! You have a chance to earn more entries! Scroll down to figure out how. I'm offering y'all a chance to win five (5) bonus entries to two contests of your choice(excluding bonus contests). For a total of 10 bonus entries! All you have to do is copy the post I have written for you (in the box below) and post it on your blog today! This offer ends at 10:59 MST tonight. So you'd better hurry! After you post, please fill out THIS FORM. COPY AND PASTE THE FOLLOWING POST: CLICK HERE to see what it should look like (don't worry if it isn't exactly the same, and feel free to change the wording a little! )You may title it whatever you like. That's right, all FIFTEEN (15) giveaways end at 11:59 pm MST tonight! But don't worry! You still have time to enter! Below I've listed all of the possible things you can win. 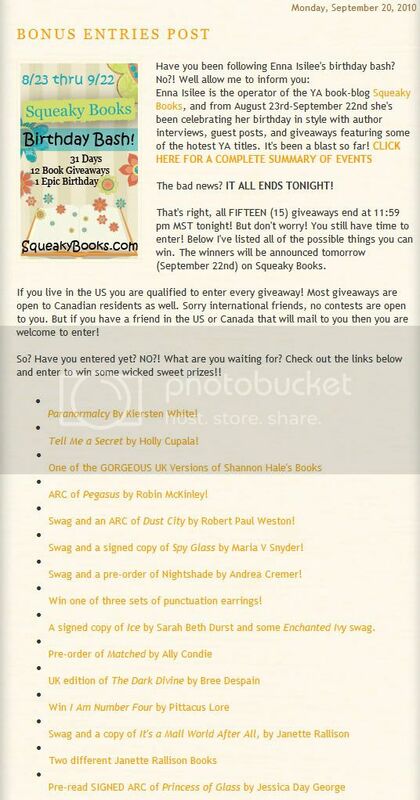 The winners will be announced tomorrow (September 22nd) on Squeaky Books. If you live in the US you are qualified to enter every giveaway! Most giveaways are open to Canadian residents as well. Sorry international friends, no contests are open to you. But if you have a friend in the US or Canada that will mail to you then you are welcome to enter! So? Have you entered yet? NO?! What are you waiting for? Check out the links below and enter to win some wicked sweet prizes!! Thank you for making the bash so wonderful! Good grief. How do you keep track of all of these giveaways? I didn't realize there had been so many! Hope you had a great birthday month!